The absurd and clearly disproportionate interference of police forces in the Freedom Day peaceful gathering held on March 25 in Minsk, which resulted in several detentions, including of several opposition politicians and known musicians, continued to have repercussions later during the week. 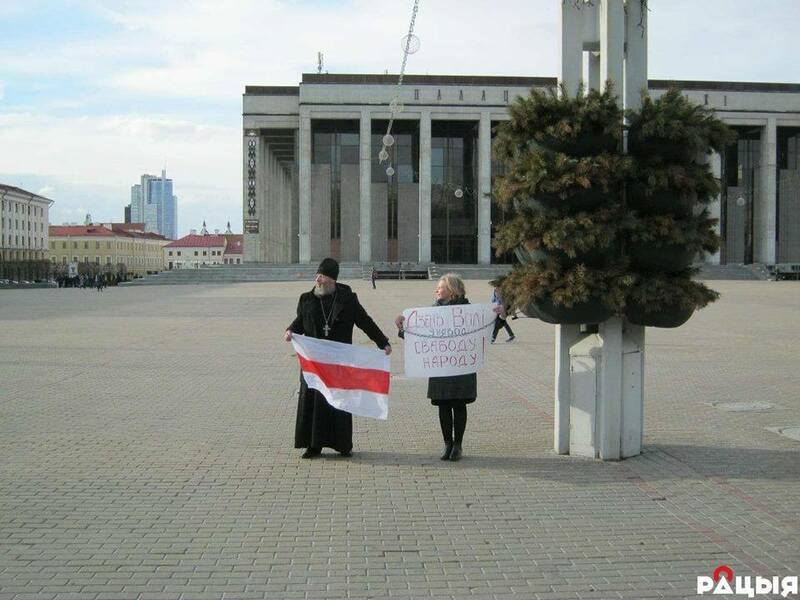 On March 28, activist Alena Talstaya was sentenced to a fine of 1,020 rubles (USD 480) for chaining herself to a lamppost in Minsk’s central Kastryčnickaja Square. The woman was holding a banner reading “Freedom Day in Unfreedom. Freedom for the People!”. The action lasted about 10 minutes and ended with arrest. Besides the monetary penalty, Ms. Talstaya had to spend three days in pre-trial detention. This shameful practice has been criticized by human rights defenders as double punishment. Dzmitry Paliyenka, former political prisoner and Amnesty International’s prisoner of conscience, has been on hunger strike since March 25, after his arrest last Wednesday. The activist is under criminal investigation on assault charges for allegedly using pepper spray against a rowdy passerby. According to Paliyenka’s fellow activist Viachaslau Kasinerau, Dzmitry is protesting against violations of his rights, including access to regular medical care and freedom of correspondence. “Since his arrest, a lot of people have written to Dzmitry, but only one letter has reached him,” Kasinerau said. The Interior Ministry chose to not consider an online petition requesting to reverse the expulsion of Mehrdad Jamshidian, an Iranian wanted by Iran for apostasy and alleged murder, despite warnings by international human rights organizations that he would be at risk of torture and the death penalty if sent back. Jamshidian has suffered a heart attack while awaiting deportation, which is still being appealed in court. Iran is one of the top executioners in the world, sending hundreds of people to death every year. Executions are public in Iran. Death convicts are usually hanged from construction cranes.